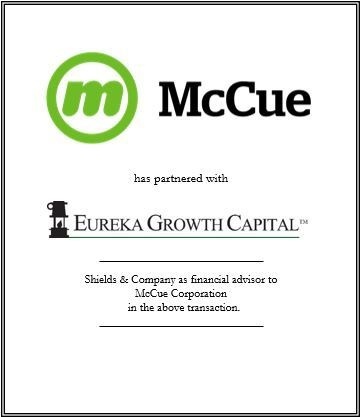 Shields & Company advised McCue Corporation in its partnership with Eureka Growth Capital. McCue Corporation, founded in 1988 by David McCue, is a global provider of total damage prevention solutions for the retail and material handling industries. The Company’s products are designed to make commercial environments safer, more appealing, and more efficient. Jonathan Chou, Partner with Eureka commented, “We are excited to work with CEO David DiAntonio and the rest of the talented team at McCue to continue the impressive growth the Company has experienced over the last several years." Tassie Oswald, Vice President with Eureka added, "McCue is well-positioned to capitalize on the increasing need for retailers to refresh existing stores and introduce new concepts as well as the rapid growth in distribution and warehouse facilities driven by e-commerce." “McCue has become a market leader in damage prevention by focusing on product innovation and customer service.” said Chris Nicholas of Shields & Company. “We look forward to the company’s continued growth as it leverages these strengths into new segments of the retail and material handling industry.” Jon Herzog of Goodwin Procter LLP served as McCue’s legal advisor and Jason Fennessy at RSM provided transaction accounting services to the seller. Barb Shander of Morgan, Lewis & Bockius LLP represented Eureka Growth Capital in the transaction. Shields & Company acted as a financial advisor to McCue Corporation in the above transaction.